Sorry that title was a mouthful, huh? 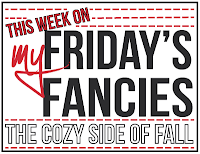 Let me explain, I'm linking up with Blonde Episodes for Fashion Friday, Long Distance Loving for Friday's Fancies, and posting a blog hop for my Favorite Things Swap. Whew. I hope you're not too tired already! Let's start off with the fashion. The weather is cooling down (but only a bit in Southern California) and I am ready for a full-blown fall. I love autumn attire, like this outfit. A BIG thank you to everyone who participated in the swap. I was scared to host because I wasn't sure anyone would sign up but I was so excited that nearly 40 of you played along! That's amazing. Thanks so, so much! I was paired up with the adorable Ashlyn of My Unrehearsed Life and received a great package of goodies! Unfortunately I didn't think to take pictures of the package I sent Ashlyn, but the contents included The Hunger Games book, and fall scented candle, and argyle socks. Three of my loves! Now it's time to show off what you received in the swap. Link up with your Favorite Things Swap post and show off the goods (you can list your blog name instead of post if you'd like). Be sure to link to your partner's blog so they can get some exposure. I hope everyone was able to make at least one new bloggin' buddy as a result of this swap!! If you haven't entered my giveaway yet, check it out here! P.S. No Man Candy Monday this upcoming week. I'll be doing a Hart of Dixie review instead. Be sure to stop by to check out what it was like meeting Rachel Bilson! P.P.S. 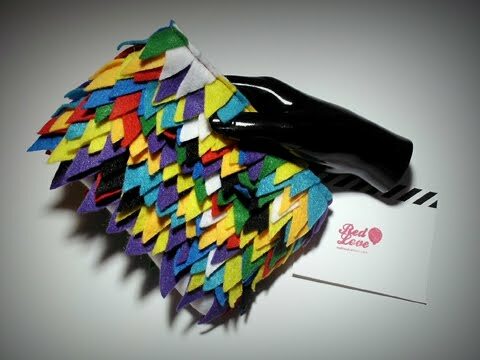 I have another giveaway in the works for next week and an awesome clutch is up for grabs. Here's a sneak peek! Looks like you got some good things! I would love to participate in a swap like this, can't wait till next time! You got some really cute goodies Leeann! This link up was a fantastic idea! Can't wait to see everyone's stuff! I'm in love with that red coat, it's so freakin' cute! You got some pretty nifty things from your swap buddy, that scarf is totally adorable & that gum is the best haha. I am loving the coat and sweater so much... and of course the boots. I ADORE that cute little sweater! So pretty. And what a fun package you got! I love everything about that fall look! I'm totally in on the next swap, I was just overwhelmed with other stuff going on. How did she find Cadbury mini eggs? Those are my favorite things in the world! That outfit is so cute! The coat and gloves are adorable. I would certainly wear it!! It was a fun swap! i really like that red coat--it's lovely for fall. that essie polish looks like the perfect shade for fall! Thanks for commenting on my blog ~ I'm glad I found you because of it! 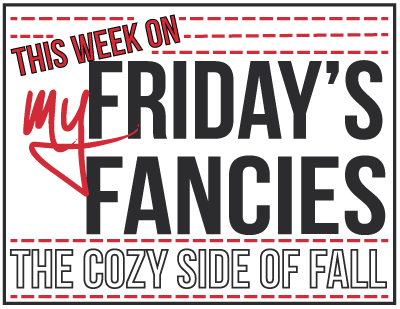 Your Friday Fancies outfit is *adorable* and the idea of a swap like this sounds so fun! I'm hopeful that you decide to host another! Oh my gosh your outfit is darling! Absolutely perfect for Fall! I love your title alliteration :) I also love the idea of a favorite things swap! I wish I would've known! 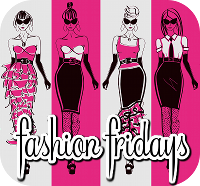 Love your FF outfit! So exceptionally cozy! Have a great weekend! i love your outfit leeann! i love those earrings and am dying for a red coat like that, have a great weekend! LOVE the scarf and nail polish! What a fun swap! What a darling swap - cuuute stuff and all of the color I am loving! Congrats on your lovely package Leeann! I love surprise packages in the mail. p.s. love that winter colour combination at the top! definitely my style. Gotta get me some red leather gloves! Great outfit! I'm really loving the statement pea coat. that swap looks like so much fun - i've never taken part in one, but now i want to :) when are you going to do another one? also, loving your friday's fancies. love the red coat! Ok first off, I have got to get a bag like the one in your Friday's Fancies. Love it! Also, I loved the Hunger Games book and I'm sure Ashlyn will too! Great gift! LOVE the read peacoat! Just gorgeous! Love the bright pops of red, perfect for pepping up your winter wardrobe. Looks like you have some really fab goodies too, lucky girl. Looks like y'all had a awesome swap! And I LOVE those gloves! I am in love with the red jacket you picked! Oh I love that red coat! Thanks again for organizing this swap. It was a lot of fun! And I met a new blogger to follow.